It has been a big week of transitions: Gathering Place, No Longer Empty's exhibit in a disused storefront on West 8th Street, was not extended as had been hoped and my cup installation came down on Monday. 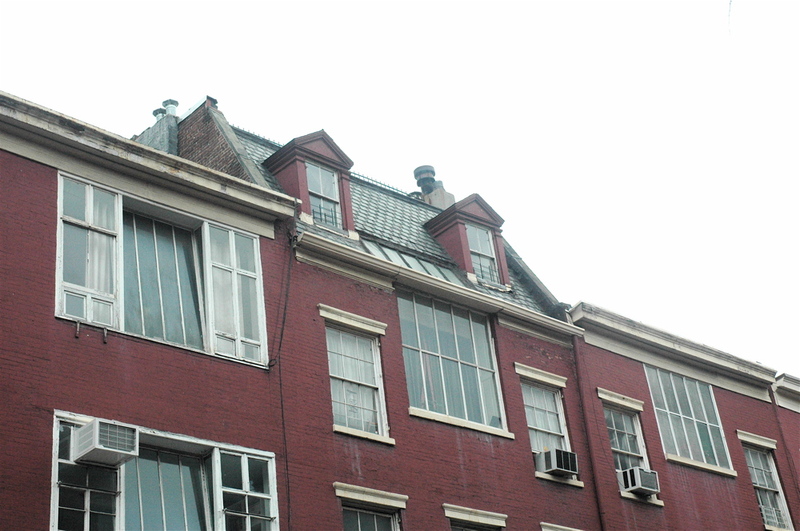 (The space was leased by a commercial tenant. Ah, the gentrifying power of art!) Diptychs, Triptychs and Multiples at City Without Walls in Newark, entered its final week and Families/Cities Shift opened at Susan Teller Gallery in SoHo. For this third exhibit, I am showing a new installation of cups drawn in Ecuador and in New York City, with the underlying narrative of an immigrant's shifting idea of home. I am especially excited about the exhibition at Susan Teller Gallery, because it is not often that I get to exhibit my artwork alongside that of my sister Kitty Leech (costume designer), mother Louise Leech (painter) and maternal grandparents Katharine McCollum Gallagher (poet/illustrator) and Michael J. Gallagher (WPA print-maker). 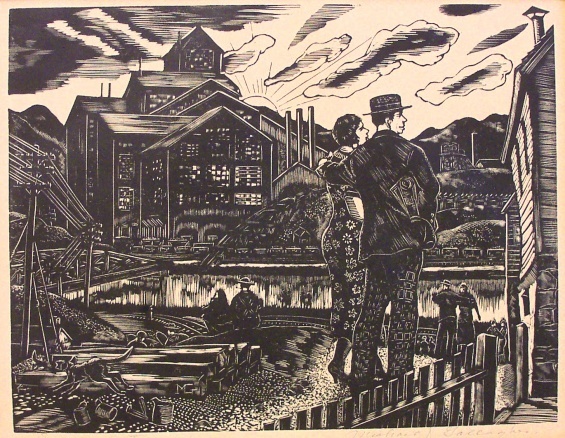 Grandma K. and Grandpa Mike met at art school in Philadelphia in the 1920s. She was a flapper. He was a rough diamond from a Pennsylvania coal town. In this iteration of the family show, Susan Teller has paired us with the Pinto family: Angelo Pinto and his wife Gertrude Dwyer Pinto (print-makers and painters), and their daughters, Anna Pinto (calligrapher) and Jody Pinto (environmental and public artist). It was a pleasure to meet Jody and Anna in the run-up to the show and to discover that our family stories crisscross and intersect through both New York City and Philadelphia, going back as far as the Philadelphia WPA print project in the 1940s where Michael and Angelo are thought to have met, and to the Barnes foundation where Angelo taught and my mother studied. Along with this idea of shifting homes, I have been interested by the way my cup artworks keep changing context in each of these recent shows. In Diptychs, Triptychs and Multiples, a group show curated by Shira Toren, they are part of a larger idea about compounding and changing meaning through repetition. 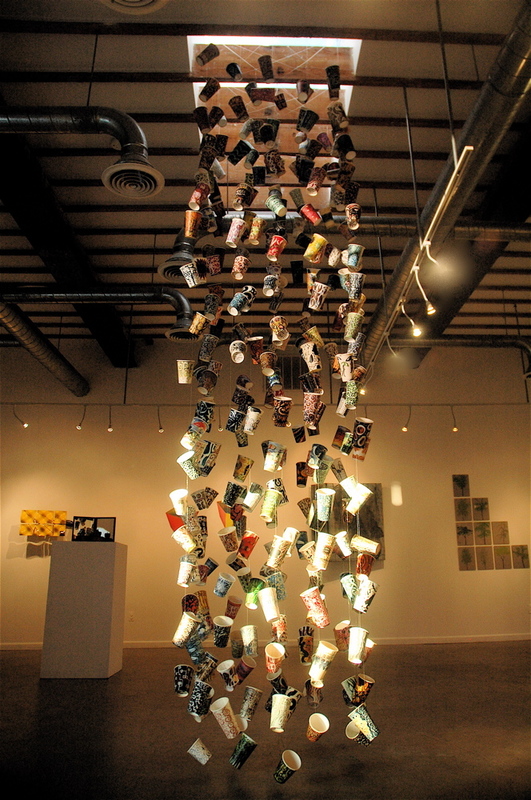 There I have hung a cascade of 365 cups, representing a year's accumulation, that spills down from the ceiling and makes visible a habit of consumption as well as a personal habit of idea generation. There are 12 other artists in this handsome show which is still up through next Saturday, April 13th. In Gathering Place the cups were part of yet another context emphasizing culture and commerce. Curated by Katherine Gressel and Jessica Whallen, the idea of community transformation was in the foreground. Neighborhood families as well those from far-flung parts of the boroughs gravitated to the space to sit with me and turn trash into art while sharing stories about a changing city. All the artists in Gathering Place shared an interest in community and site: from Jennifer Maravillas' map of changing land use in the Village, to Micki Spiller's temporary library of books by city authors and about the neighborhood, to Luisa Caldwell's shopping bag installation featuring ghostly glow-in-the dark drawings of shoes, evoking the departed shoe stores that so recently characterized the street. I had plenty of time to muse on change as I sat for hours in the window of #24. 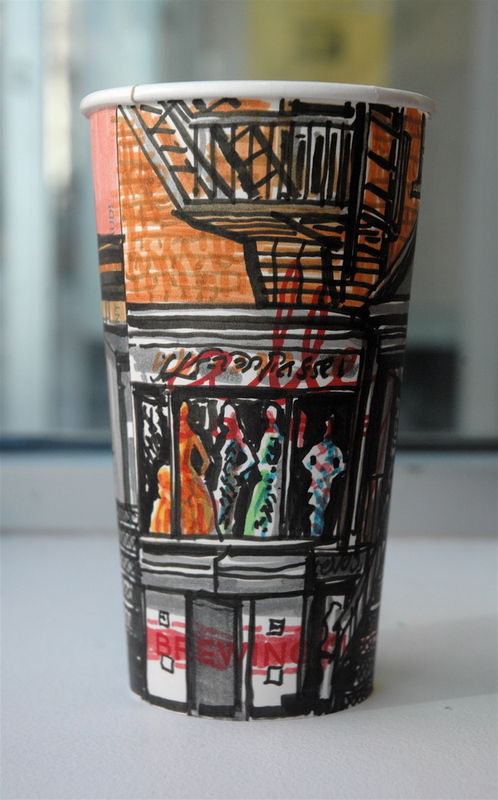 Whereas my cup drawings are often abstract, there I found myself depicting very specific architectural details: fire escapes, roof lines, wrought iron lamp posts, ornate shop fronts and doorways across the street. After awhile, I no longer saw West 8th Street as a parade of failed businesses, but appreciated it as a place with good bones and a long history. I relished the tales local residents shared. And going back and forth along the block, I especially loved looking up at the many artists' studio windows still visible, telling a story about the neighborhood that goes back many generations. It is good to be reminded that our perceptions of architecture, artifacts and even personal history are mutable, all part of a constantly changing kaleidoscope of meaning in this most kaleidoscopic of cities. 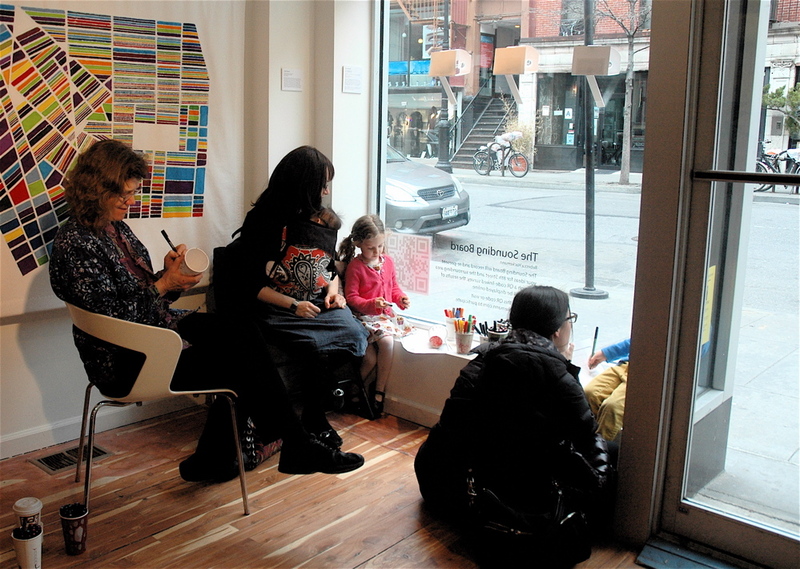 Families/Cities Shift is open Tuesdays - Saturdays 11-6pm at 568 Broadway, #502. Curated by Susan Teller, it is a special project for the New Museum's 2013 City Ideas Festival. Artworks by Michael J. Gallagher, Katharine McCollum Gallagher, Louise Leech, Kitty Leech and Gwyneth Leech, Angelo Pinto, Gertrude Dwyer Pinto, Jody Pinto and Anna Pinto. Diptychs, Triptychs and Multiples, curated by Shira Toren, is on view at City Without Walls in Newark through Saturday April 13th. Including works by La Thoriel Badenhausen, Marianne Barcellona, Yvette Cohen, Bill Dilworth, Rodolfo Edwards, Judy Glasser, Bernard Klevickas, Gwyneth Leech, Robert Lobe, Janie Milstein, Paula Overbay, Joan Reutershan and Lili Sheer. Gathering Place ran from Feb 22 - March 22. Curated by Katherine Gressel and Jessica Whallen, it was No Longer Empty's inaugural Curatorial Lab Project. More information about the curators and artists here. 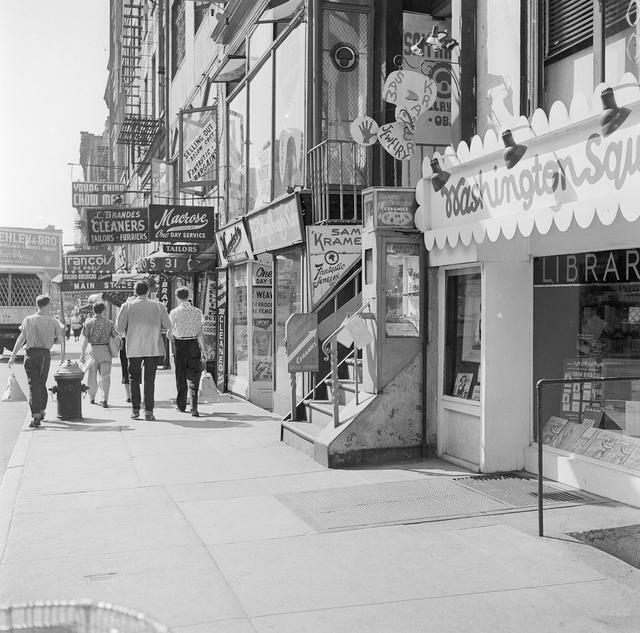 NLE hope to continue doing exhibitions in unused retail spaces on West 8th Street.